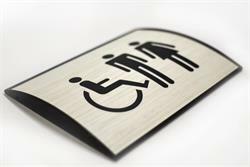 We offer a broad selection of restroom signs & bathroom signs with Mens, Womens, Unisex, handicapped or custom bathroom sign designs - as well as bathroom directional arrows or any custom graphics. Brushed metal bathroom signage and signs made with wood or frosted acrylic - add a contemporary look to any office, spa, restaurant or professional environment. 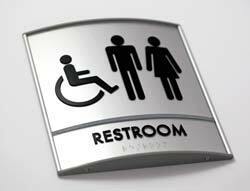 We also carry ADA braille bathroom signs, hand washing signs and baby changing signs for your public restrooms, toilets and office bathrooms. Need a custom restroom sign? Let us know if you require a bathroom sign you don't see listed on our web site - we fabricate custom bathroom signs and custom braille signage each and every day. 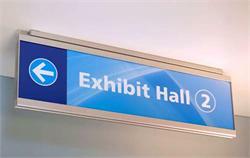 Avoid frustrating your customers and guests, show the way with professional bathroom and restroom diretional signs, hallway signs and bathroom door markers. 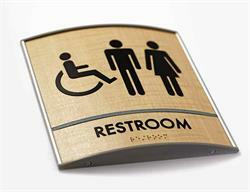 Our premium ADA restroom signs add style to any bathroom door or restroom hallway. 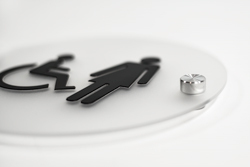 Contemporary silver or black stand-off accents add a rich accent to our 9.5" Diameter braille restroom signs - A stylish addition to any office or business restroom. 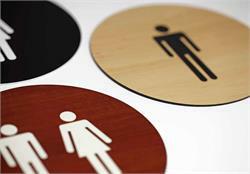 Round frosted acrylic restroom signs with black raised text and graphics and stand off mount are an up-to-date, fashionable look for any bathroom. 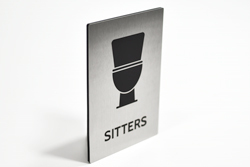 These signs are a great option for restrooms in your eating establishment, gym, shopping mall and more! 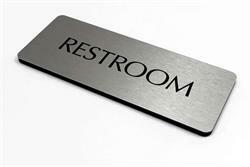 Modern brushed metal restroom signs with rich, black 1/4" thick mounting. Give your office restroom an update with a hint of contemporary style. 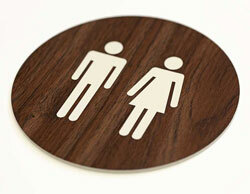 Personalize your bathroom sign at no additional charge. Various office sign sizes available. 2 sided ceiling mount sign with black anodized aluminum bracket. Architectural grade metal frame construction 6" x 6"insert. Directional wayward signs help avoid confusion in hospitals and professional environments. Custom sign sizes available. 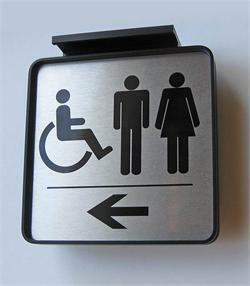 A Bathroom or Restroom directional sign points the way and helps prevent confusion in offices, churches and public environments. 4 Metal Plate Colors Available. Architectural Signage for interior offices, business entrances, church signs and more. Contemporary bathroom signs - 8 x 8.1875 curved restroom sign with 2 inch high text area and 6 inch high main insert area. Sign includes grade 2 ADA braille, tactile (raised) text and graphics in black. Curved office signs and restroom signs. Easily update exam room signs, medical markings, restroom signs and more, with our solid aluminum satin projection mount signs. Ideal for hallway and corridor door markers and directional signage. Non glare removable lenses for displaying any message. Curved wood signs with tactile text and graphics offer a modern look for any contemporary office space. This modular system comes in many different sizes making it easy to add matching signage to your office building as needed. Popular curved-face bathroom sign systems - 7.87 inches wide x 8.1875 inches high with 2 inch tall sign divider area (main graphic area is 6 inches tall). 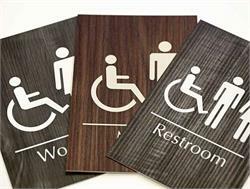 Contemporary restroom signs with ADA braille and premium wood-tone overlays. 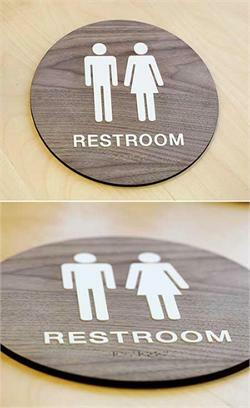 Cool restroom signs. 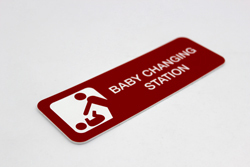 Laser engraved baby changing signs with text and graphics are available in multiple sizes and color variations. Post them near the bathrooms in your shopping center or the restrooms in your airport. 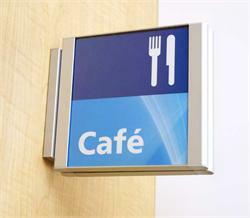 Curved restroom signs with metal insert are a great contemporary option for a modern office building. Choose from a variety of metal plate colors and customize with any graphics or text you need. Inserts can be removed and replaced as needed. 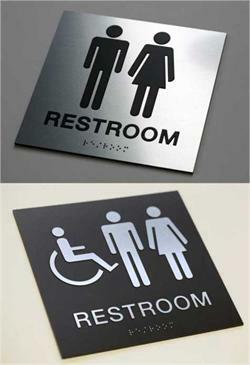 Economical ADA braille restroom signs are a durable black plastic with raised white graphics/text and grade 2 braille. Choose from a variety of graphics including the accessible wheelchair. Signs ship right away. These 6"W x 9"H humorous bathroom signs are 1/16" thick laser engraved acrylic that boast a crisp design and are a durable, easy to clean option for restrooms in your office, restaurant or bar. Available in a variety of two color combinations. 6"W x 9"H humorous flush mount restroom signs for Standers and Sitters are a lighthearted way to label the bathrooms in your bar, restaurant, shopping mall, or employee restrooms at the office. Available in a variety of metal colors. 3-3/4 inch wide x 3/4 inch high engraved simple restroom signs are a subtle yet professional way of marking the bathrooms in your office building. Available in a variety of color options including metal and wood like finishes. 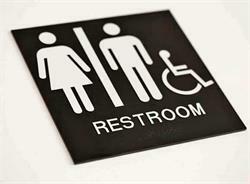 6" x 6" Unisex, Mens, Womens, Handicapped, or custom restroom sign insert with hangable frame. Various frame and sign colors to choose from. Wall, door or glass mount. Frame is 1/2" deep. Choose from mounting options for easy installation. 9" x 9" or 12" x 12" Bathroom Signs - Unisex, Mens bathroom , Womens bathroom, Handicapped, or custom restroom sign plate with frame. Various plate colors to choose from in in brushed metal. Wall, door or glass mount. Frame is 1/2" deep. 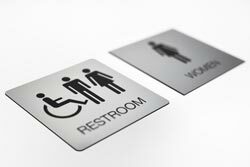 Standard laser engraved restroom signs are a professional, simple solution for labeling restroom signs in your office building, restaurant, or small business. Signs are available in a 6 x 6 or 8 x 8 inch standard, with your choice of graphics and text. 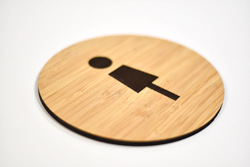 Round acrylic restroom signs in wood tones with laser engraved text. 6" and 10" sizes available in grey, carbon and teak wood color options. Include graphics only for a simple look, or add text for no extra fee! 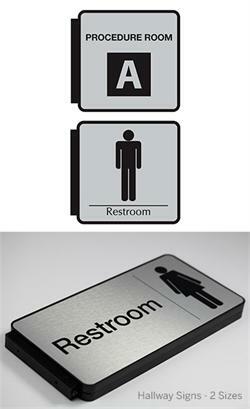 5.75 x 5.75" (in photo) brushed metal restroom signs with rich, black 1/4" thick mounting. Give your office bathroom an upgrade with a hint of depth and plenty of style. Free text personalization and free standard restroom graphics. Various sizes. Men's Title 24 California Braille Signage Set. Premium ADA compliant sign set complete with geometric symbol for door and corresponding wall sign. Premium CA braille bathroom signs. Unisex Title 24 California Braille Signage Set. Premium ADA compliant sign set complete with geometric symbol for door and corresponding wall sign. Women's Title 24 California Braille Signage Set. Premium ADA compliant sign set complete with geometric symbol for door and corresponding wall sign. 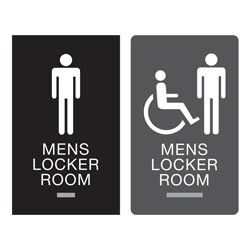 ADA Braille MENS LOCKER ROOM signs in 6" x 10" size. 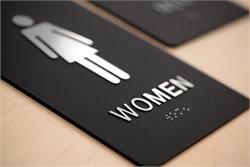 ADA compliant wall signs include grade 2 braille and 1/32" tactile lettering/graphics. Plates are 1/8" thick acrylic. Available in a variety of colors and finishes. 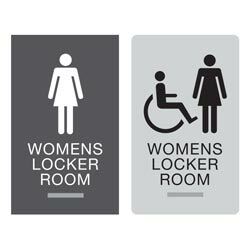 Guide the public with our ADA Braille WOMENS LOCKER ROOM signs. 1/32" tactile (raised) lettering/graphics with ADA compliant grade 2 braille. Signs are available in brushed metal finishes or multiple two-color combinations. Plates are 1/8" thick acrylic. 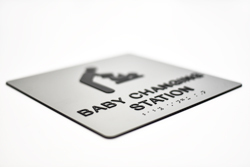 Laser-engraved baby changing station signs. Great for labeling these specific areas in your facility. Available in multiple color combinations and sizes. 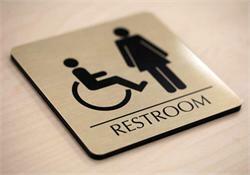 8 x 8 and 9 x 9 ADA Braille Unisex, Mens, Womens, Handicapped, or custom restroom signs. Premium ADA compliant signs come in various finishes with Grade 2 raised braille dots. Wall, door or glass mount. Plates are 1/8" thick acrylic. 2 Sided Large Hallway Sign 12" x 6" OR 12" x 12"
2 sided corridor signage with easy-mount black anodized aluminum bracket that conceals screws. Directional wayward and hallway signs help avoid confusion in hospitals, schools and professional environments. Custom sign sizes on request. 6" x 9" ADA Braille stairs sign. Premium ADA compliant signs come in matte black finish with Grade 2 raised stainless steel braille dots. Wall, door or glass mount. Plates are 1/8" thick acrylic. QTY Discounts apply. 12" x 9" - 2 sided ceiling mount sign with black anodized aluminum bracket. Architectural grade metal frame construction. Directional wayward signs help avoid confusion in hospitals and professional environments. Free custom text and sign personalization. Double sided ceiling mount overhead wayfinding signs. Large horizontal sign is sold blank to easily add any custom insert. Clear removable lenses for easy message updates. Several sizes available. 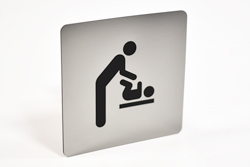 9" x 9" ADA braille Baby Changing Station signs include 1/32" tactile text and graphic with grade 2 braille. These signs are ADA compliant and available in a variety of color options to best match your shopping mall, clinic, or hospital. ADA Braille Family Restroom Signs - 6" x 9"
6" x 9" ADA compliant Braille Family Restroom Signs include a man, woman and child graphic with the option to add a wheelchair graphic. Signs include grade 2 braille and 1/32 inch tactile text. Plates are 1/8" thick acrylic. 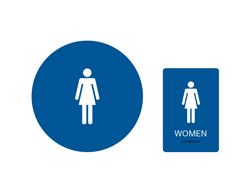 9" x 9" ADA Compliant Gender Neutral Restroom Signs include gender neutral graphic with the option to add a wheelchair graphic. Signs have grade 2 braille and 1/32 inch tactile text/graphics. Plates are 1/8" thick acrylic. 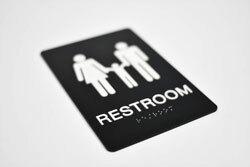 7" x 9" ADA compliant Braille STAFF ONLY RESTROOM signs can be customized with your choice of tactile restroom graphics and includes the corresponding grade 2 braille and 1/32 inch tactile text. Plates are 1/8" thick acrylic. 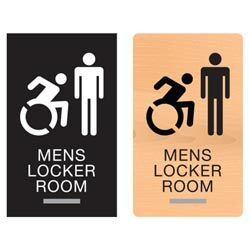 Custom Mens Room, Womens Room or Handicapped Restroom Signs. 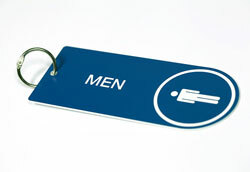 Brushed metal bathroom signage available with virtually any graphic or gender. Restroom signs available with or without frames. 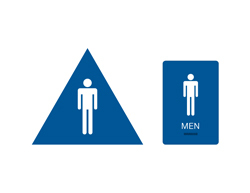 Free mounting options for your Professional restroom signs. 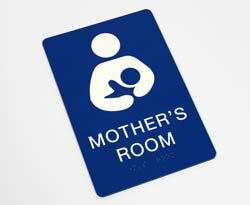 6"W x 9"H ADA Braille MOTHERS ROOM sign. 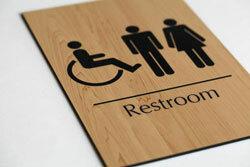 ADA compliant signs include 1/8" thick plate with 1/32" tactile raised text and graphic and Grade 2 braille. Wall, door or glass mount. 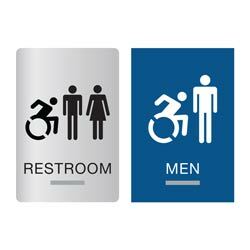 New York ADA Braille restroom sign with Men, Women, Family and Active Wheelchair graphics available. Signs include 1/32" tactile (raised) text and graphics with grade 2 braille. Multiple sizes available. 6" x 10" New York ADA Braille LOCKER ROOM sign with 1/32" tactile (raised) text and graphics with grade 2 braille. Men, Women, Family and Active Wheelchair graphics available, along with many different color combinations and finishes. 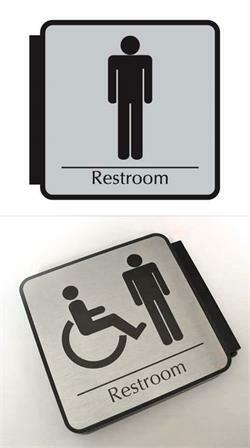 6"W x 9"H ADA Braille Unisex, Mens, Womens, Handicapped, or custom restroom signs. 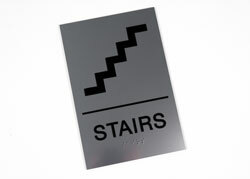 Premium ADA compliant signs come in matte black finish with Grade 2 raised stainless steel braille dots. Wall, door or glass mount. Plates are 1/8" thick acrylic. 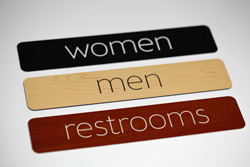 6" x 9" rich wood tone restroom signs with black graphics and lettering. 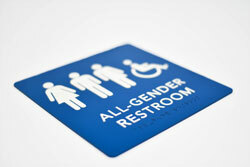 Unisex restroom signs, Mens, Womens & Handicapped bathroom door signs. 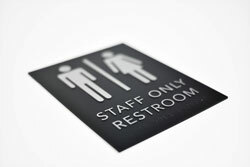 1/8" thick restrooms signs have a rich black edge making these bathroom signs very stylish and contemporary. 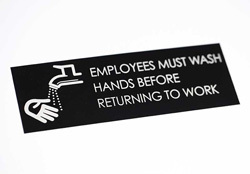 Laser engraved Employees Must Wash Hands signs are a low profile option for displaying a friendly reminder in staff restrooms or bathrooms in your medical facility, dental office, restaurant, school and more. Keep track of the keys to your public or private restroom with these hard to miss laser engraved bathroom key chains! 6 inch long by 2.5 inch wide durable acrylic key tags available in a variety of two color combinations. 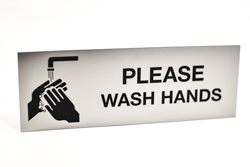 10 x 3.5 inch laser engraved PLEASE WASH HANDS signs are a low profile, easy to clean solution for restrooms and bathrooms in food establishments, medical facilities or any production areas that use chemicals. Available in a variety of color combinations. 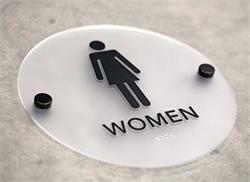 Simple Engraved Restroom Signs for interior and exterior signage needs. Free text personalization. Laser engraved - bathroom signs available in many colors. 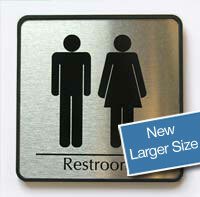 6" x 6" double-sided restroom signs may be customized with the text and graphics. 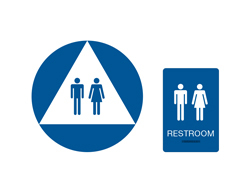 Corridor flag directional signs will help avoid confusion in any professional environment or medical facility restrooms. Easy-mount bracket included (screws not provided). Employees Must Wash Hands Sign-Available in 4 plate colors - brushed silver, gold or copper. also in white.Custom personalization available - includes hand washing graphic. Free mounting options. 2 sizes available. These fun, colorful metal 10 x 5 inch hand washing signs are the perfect addition to any school or daycare restrooms and cafeterias reminding and teaching kids to wash their hands. 10" wide restroom/bathroom sliding occupied door sign. Available in mens, womens room or handicapped signs. Brushed metal restroom signs in silver, copper, gold, white or any printed color to match your decor. Need a custom bathroom sign? Let us know! 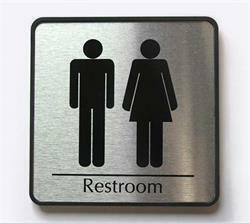 We create restroom signs in any shape, size and color! We also offer a great selection of ADA braille restroom signs and braille signs for your public restrooms, toilets & offices. Need a custom sign solution? We can do that.